"These belong in a museum! But I'm keeping 'em anyway." 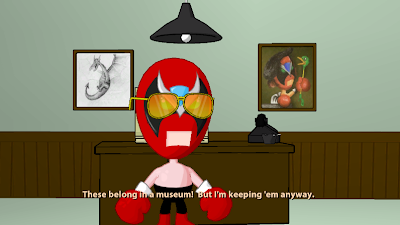 One of Dangeresque's remarks when you click on the paintings in his office is that "these belong in a museum! But I'm keeping 'em anyway". This is a reference to Indiana Jones saying that the cross of Coronado belongs in a museum in Indiana Jones and the Last Crusade. This was also used as an injoke in many LucasArts adventure games.